James Bond and “Spectre” triumphed in their debut at the North American box office this weekend, but Charlie Brown and “The Peanuts Movie” kept the suave super spy from breaking major records with his $73 million opening. Bond is a global phenomenon however, and “Spectre” showed plenty of firepower overseas and was pacing ahead of “Skyfall” for partners Eon Productions and MGM, and distributor Sony Pictures. This weekend, it took in roughly $120 million internationally, and its worldwide total has topped $300 million in less than two weeks of release. On its way to becoming the highest-grossing 007 movie ever, “Skyfall” enjoyed a Saturday surge in its domestic debut that saw its grosses top its Friday number by 11 percent. The Saturday number for “Spectre,” the worst-reviewed of any recent Bond film, was about four percent under its Friday figure. That suggests that word-of-mouth — which travels fast in today’s social media-driven world — hurt rather than helped. Despite its mediocre 62 percent Rotten Tomatoes score, first-night moviegoers awarded it an “A-” CinemaScore, so we’re talking a degree of appreciation by fans, not a rejection. The studio’s deal with MGM and Eon to distribute the Bond films ends with “Spectre” and speculation is strong that there will be a new distributor. It’s hard to quibble with the job Sony has done. The franchise was reinvigorated with “Skyfall,” the top-earning 007 movie ever, and “Spectre” faced some major hurdles, so this performance is still impressive. And “Spectre” faced some unique challenges: An early version of the script was stolen and leaked in last year’s notorious Sony hack. Director Sam Mendes faced overruns on a budget that was overblown to begin and wound up at $145 million after taxes, Sony said. There was a messy hat dance with the Mexican government over tax credits too. And Craig suffered a knee injury on the set, which he followed in recent weeks with an Aston Martin-full of caustic comments about the world’s most famous spy. 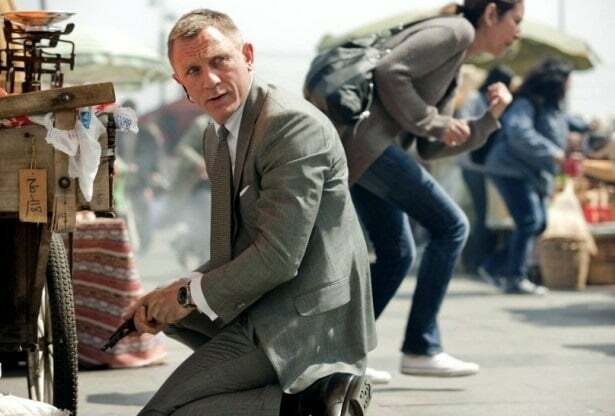 “The Peanuts Movie,” which Fox hopes will launch a family franchise, was also a problem for Bond. Analysts had estimated prior to the film’s opening on Friday that any grosses over $35 million for Charlie Brown could be seen as taking away from those of “Spectre.” While the target demos for the PG-13-rated spy movie and the G-rated kids tale seem significantly different, both played well with young and old, male and female. The big “Peanuts” opening reflects an impressive job by Fox marketing chief Marc Weinstock and his team. While “Peanuts” is beloved by many, the strip ran from 1950 and 2000 and hasn’t been active for 15 years. It was just the opposite of most animated movies. With the older crowd largely in hand, the younger set had to be sold — and they were. Forty-six percent of the audience was under 25 years of age, and 55 percent were women and girls. The strong showings by the two films reversed a three-week run of lackluster showings by the overall box office, which was coming off the worst October in 15 years.